What do you do when you've accumulated three or four dollars in eBay Bucks and they're going to expire soon, but you don't have enough money to just use them like a coupon for a bigger purchase? 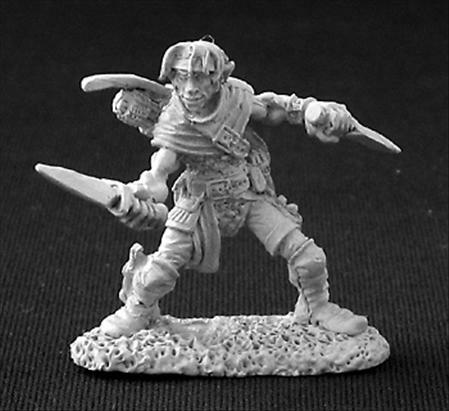 You buy something cheap... and in this case, it was my first Reaper miniature, Dilean Softstep the Half-Elf Rogue. I would probably have gotten more use out of some Warhammer 40K bits, but after writing yesterday about my first experience painting a miniature, I decided to go for something I might someday use for D&D. It was a quick decision, made amidst grad school work when I remembered that my eBay Bucks would expire soon, so I hope the model lives up to my expectations. 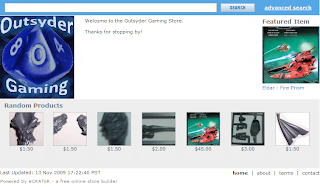 If he doesn't, I'll just add him to the Outsyder Gaming store and forget about him until someone else shows interest. In any case, if I do decide to keep the model, I'll post pics whenever I get him painted to my (admittedly amateur) standards. My experience with Dungeons & Dragons started with my dad's first edition AD&D books, but sometime in late elementary school (after my parents split up) my mom talked me into throwing them away and purchasing a less controversial game. I managed to convince her to let me buy Rifts: Conversion Book One (which was useless for a long time because I didn't have the actual rules for the game). Ironically, the warning in the front of the book about "violence and the supernatural" actually helped. At some point (when I was in middle school, if I remember correctly), my dad found out that his old D&D books were gone and bought me The Classic Dungeons & Dragons Game. We played through most of the adventure together that summer. 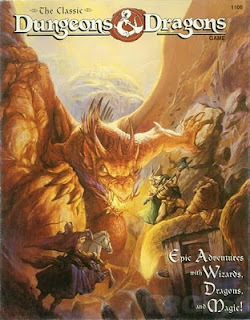 In time, I slowly transitioned from this set back to advanced D&D with the 2nd edition Player's Handbook and DM's Guide, but I still remember how cool I thought this game was at the time. I had read through the first edition books, but I hadn't really understood much of it, and although I had played a solo game with my dad as the DM, he did almost everything "behind the screen," so to speak. This was the first time I had ever played D&D and actually understood the rules. I even painted my first miniature around this time, and I still have it somewhere if I could just find the darned thing. I had been intrigued before... but now I was hooked. I had completely forgotten about this version of D&D until just recently, when my brother Eric mentioned wanting to play again. I said something about being able to start quickly with Character Builder, and his response was, "Nah bro, I want to play old school. I want to actually roll up characters." For my little brother, old school means 3rd edition, but he's right about one thing... as much as I appreciate the convenience of Character Builder, I miss creating characters by hand too. 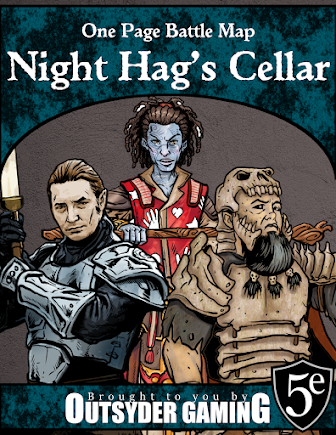 You wake up in a dark dungeon cell... you can't remember anything... you immediately notice that there are others in the cells around you... and a small reptilian humanoid with keys jingling on his belt at the end of the hallway. Time to escape from the evil wizard's dungeon! Oh, the memories! Yes, I finally got around to creating a new banner for the site. Yes, I know I first mentioned it months ago. Yes, I did start on it then... it just got put off when other things started popping up on my schedule. Finally, I decided to post a "work in progress" version just because I was tired of thinking back to the work I put into it when I first started and the shame that I'd feel if I did all that work and never posted it. Given my current schedule and the small chance that I'll ever get around to touching up the flaws, I figured I should throw it on here as is. I can always fix it later, right? It did take quite a bit of work... much more than the last one, but I think the extra work was worth the effort. A more experienced graphic artist could probably whip something like this up in far less time, but I was new to the whole GIMP 2.0 thing and I had a lot of learning to do. As I mentioned before, I'm still not quite satisfied with the result... the edges didn't come out quite right when I was making colors transparent and that kind of thing... but I do think it is better than the last one, and it is infinitely better than the first few that I had on the site. Now, back to grad school work... hopefully I'll be able to get some real writing and/or playing done in the next week or two! As it turns out... yes it is! 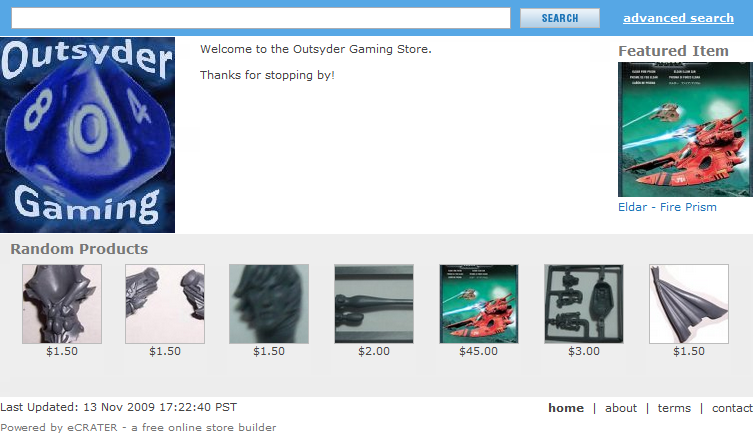 I had completely forgotten about it until yesterday, but yes, the Outsyder Gaming store is still running, even though it hasn't been updated since November 2009. What made me remember that it was there? A customer! Whoooohoooo! I just mailed his eldar pulse laser (from the falcon kit) this morning. Now I just need to update my inventory. I've got a bunch of new stuff that needs to be added, like some used D&D stuff, some older Magic: The Gathering cards, and the razorback/Dark Angels bits left over from my Blood Angels. Thanks to all my visitors... especially the ones who visit the store! Okay, so last week I mentioned breaking up armies into 500 point chunks in order to lessen the preparation time on game night (more detail here). 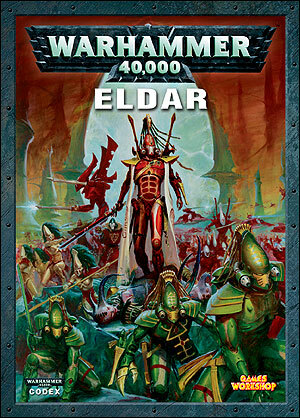 Today, we're going to look at the first army, my Eldar. Notes: Yeah, I realize this is probably crazy. It's a hammer unit and two minimum-sized troop choices. The problem with my Eldar is that I'm too attached to certain units... like my seer council. I spent so much time working on the conversions that I just can't bring myself to play my Eldar without bringing them along for the ride. Notes: This chunk basically just mechanizes Chunk #1 and adds another scoring unit. One group of dire avengers hops in a wave serpent and the other hops in a Falcon, while the storm guardians ride in the second wave serpent. 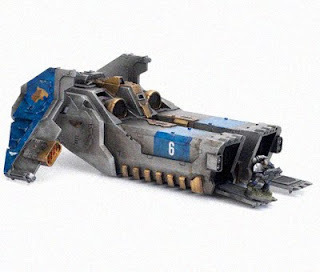 Notes: This chunk adds to the mechanized element of the list and provides much-needed anti-tank. Next time, we'll take a look at Ork chunks! Get used to the same list at different point levels... the better you know your army, the better your tactics. Organize the army into the three chunks on the shelf and just grab them as I need them... no searching for figures. Print three-page stat sheets for each army, each for a specific chunk, and pick up only the stats I need. This little project has turned out to be more difficult than I thought, especially since all of the models we have are already assembled and nothing is magnetized. Making multiple chunks of exactly 500 points is sometimes impossible, but I'm trying to get as close as I can. I do recognize that these lists will be slightly less optimized because of the neat 500 point breaking points. I'm okay with this. Over the next week or two, I'll be posting the "chunks" for each army... eldar, orks, tau, space marines, and blood angels. Everybody loves army lists, right? Feel free to make comments about how I can improve my chunks.